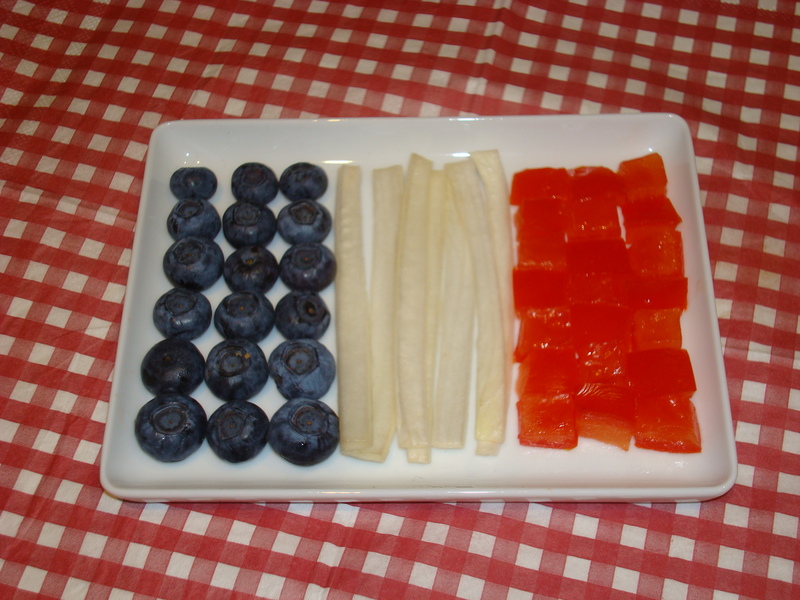 It’s Bastille Day, and what’s more fitting than a salad in the colours of the French flag, blue, white and red. I was going to make one of the typical French dishes in sauce which didn’t seem to fit a summer’s day in the end, hence a salad of blueberries, chicory and tomatoes, in a raspberry vinaigrette. Perfect for a lazy picnic, like Katia and KylieMac’s on the esplanade of Les Invalides each year. Or the white picnic out at the Château de Versaillles, where the idea is that 10,000 people picnic wearing white. Not a good idea with raspberry vinaigrette! If you’re waking up hearing the planes that means it’s after 10 and the Bastille Day military parade is underway. Climb out of bed and turn on the TV and you get the images that go with the noise. and see the soldiers from various international forces marching up the Champs Elysées in front of the President. This year the pompiers (firefighters) are honoured. Firefighters in a military parade? Yes, in France they’re military, and their training is as military as in any army. Tough. The pompiers are also the first on the scene in any accident, not the paramedics, as they’re also trained as paramedics. And after the lazing around, and maybe a walk along the Seine you end up near the Eiffel Tour to watch the annual 14 juillet fireworks, a half-an-hour of ear-pounding and an eye-dazzling explosion of colours over the Paris night sky. Tonight it’s happening from the Trocadero, opposite the Eiffel Tower at midnight French time (GMT+2), and you can watch it live from the special 14 juillet site. Or if you missed it, you should be able to watch it on replay. Alternatively you need to find someone lucky enough to have a balcony or terrace with a view of the Eiffel Tower, or head up to Montmartre and watch all the smaller fireworks displays that are set off in the suburbs of Paris. So as it’s a day for lazing around, a simple salad seemed good. But how to make one in the colours of the French tricolor? (or the Stars and Stripes of Union Jack for that matter, although I wouldn’t attempt recreating it!) Changing my mind about what to make meant resorting to rummaging in the fridge, which turned up blueberries, chicory and tomatoes, plus raspberries for zing (they toned better with the blueberries but tomatoes are true red). The blueberries and raspberries take the edge of the slight bitterness of the chicory. I thought of using the white of a courgette too, but was tinged a bit too green. Bonne fête nationale, as only we call it Bastille Day! Wash and slice the chicories crosswise. Remove the pips from the tomatoes and finely dice them. Sprinkle the blueberries over the top. Crush the raspberries a little bit and mix with the salad. Prepare the viniagrette buy mixing the ingredients together in a small jar, and shake. 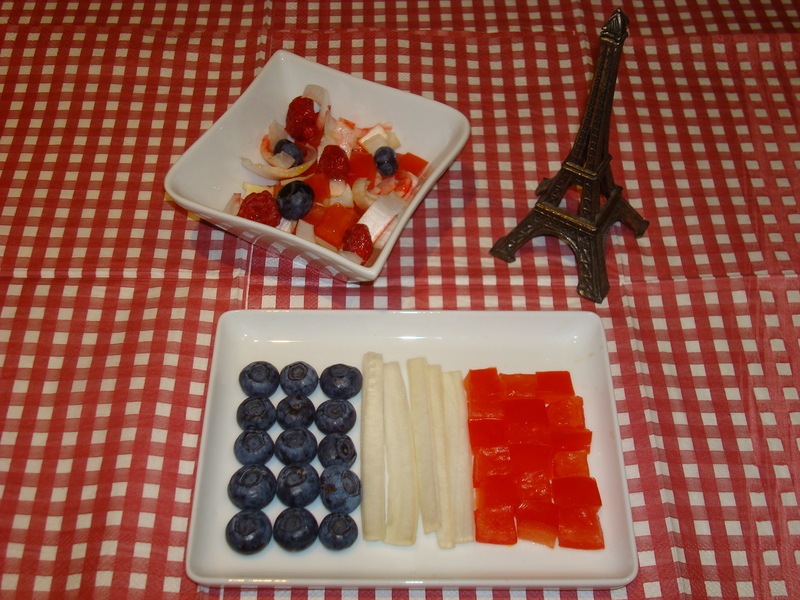 This entry was posted in Main, Salads and tagged 14 juillet, blueberry, chicory, tomato. Bookmark the permalink.